Oppo India on Thursday launched the Oppo F1s Diwali Limited Edition smartphone. Sporting the same Rs. 17,990 as the original, the smartphone will go up for pre-orders from Oppo Concept Stores from October 8 to October 13, and will up for sale on October 14 via Snapdeal. The Oppo F1s Diwali Limited Edition smartphone is identical in terms of specifications with the original Oppo F1s smartphone that was launched in India in August. 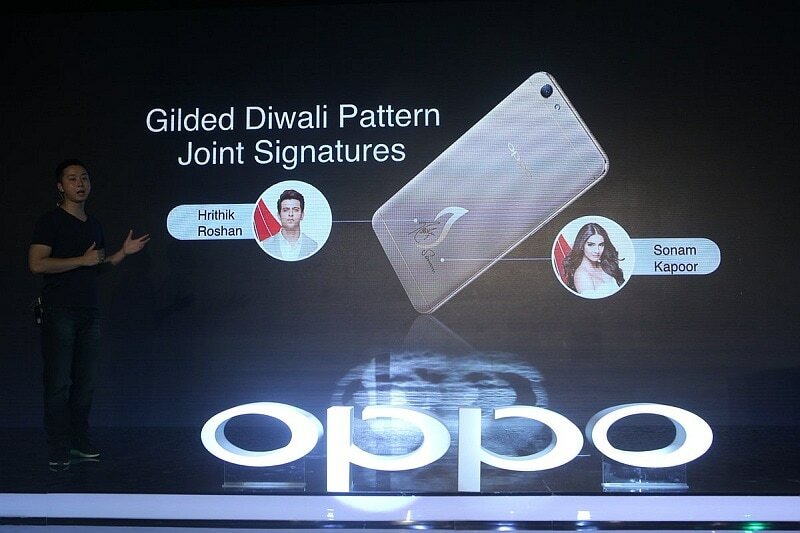 However, it features a redesigned rear panel with a ‘gilded Diwali pattern’ or a flame, alongside signatures from brand ambassadors Hrithik Roshan and Sonam Kapoor. The limited edition smartphone comes with Diwali Elements theme that bears special icons amongst other changes. The Oppo F1s sports a 16-megapixel front-facing camera with a 1/3.1-inch sensor and f/2.0 aperture, certainly the highlight of the smartphone. Other selfie-focused features on the smartphone include its Beautify 4.0 app for selfie editing, the Selfie Panorama feature that stitches together three selfies, and the Screen Flash feature. The smartphone also sports a fingerprint sensor on the home button, and Oppo claims it unlocks the F1s in as little as 0.22 seconds. The company is also touting the fingerprint sensor based shortcuts on the Oppo F1s for making voice calls and launching apps. The dual-SIM (Nano-SIM card) Oppo F1s runs ColorOS 3.0 based on Android 5.1 Lollipop, and sports a 5.5-inch HD (720×1280 pixels) IPS display with Corning Gorilla Glass 4 protection apart from support for gloved and wet touch input. It is powered by an octa-core MediaTek MT6750 SoC, coupled with the Mali-T860 MP2 GPU and 3GB of RAM.